I've been asked many times what Web 2.0 is. None of these really explain it. This does. Would be identity thieves LOVE cheques. There are several reasons for this. You can purchase cheque blanks that look exactly--including security measures--like every cheque available from banks. This makes it easy to forge cheques. All they need is to see the routing number on your cheque ONCE and they can duplicate it using the blanks above. Credit card companies often send "courtesy cheques"--many people in the U.S. have mail boxes at the end of the road and most people aren't home. They simply nab all the mail in the box. To never have a bank send you these cheques ever again, see Day 4. Lots of people with the mail boxes at the end of the driveway put payments into the boxes figuring that the Mail Carrier will pick up the payment. All it takes is a bottle of acetone for the thieves to clean the cheque and put a new amount in. They also have your routing number, see number 2 in this list. One other troubling fact is that these thieves often have driver's license blanks and the exact printers used to create driver's licenses. They can create absolutely convincing licenses. So if you think that you are safe because merchants ask for a driver's license before accepting a cheque, think again. The solution to the cheque conundrum is simple. Use as few cheques as possible, none if possible. The safest way to pay bills is by using online banking, period. ALWAYS pick up your cheques from the bank yourself. Never have them mailed to you. Always shred any re-order slips you don't use--they have your routing number on it. The cheque revelation knocked me over--they are one the weakest point in our ID theft defenses. My big brother is the CEO of a company called Iotum. His product routes telephone calls based on the revelance of that call in the situation you are in. They recently created a service called Talk-Now. "Check out iotum Talk-Now, the revolutionary New Presence application that lets you see at a glance who is available to talk, be notified when the people you need to speak with become available, and share your availability to talk with others." Alec chose to upload his video to multiple video channels and decided that REVVER provided the best quality video. He wrote reviews of the different services on his Blog. If you are interested in his video, see it below! 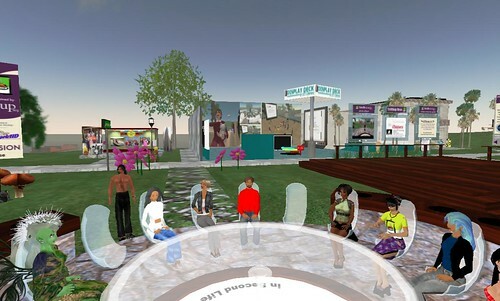 I have been intersecting with the Second Life Non Profits group for a few months now. It looks like WESTAF will be a tenant in the office space once the sim has been completed. This group has put together a Google Group which has been very helpful in keeping the group informed with one another. A Drupal site has been started that will keep the group informed and also act as a public face for the participants. WESTAF staff are starting to set up SL accounts. So, how will it be used? At first as an additional marketing opportunity. Secondly, we are figuring out another emerging tool. It remains to be seen whether we can build something practical and useful to the Arts non-profit/State Arts Agency field. It may be that we just end up with something "cool". In the mean time I am enjoying learning about the environment and the friendships that are being forged. In the end, these new relationships may be the most important part of the experience. If you're looking for me in-world, I'm Creech Antwerp.